As an avowed animation enthusiast, I have in the past and will continue to rail against the practical abandonment of traditional 2D animation in mainstream American film. Thinking back on 2013, its surprising how many of my few favorites hearkened back to the classics, with Cloudy 2's Tex Avery-esque rubber band physics, The Croods' Bedrockian setting, Free Birds' manic Warner Bros. energy, and Frozen's tribute to the 90's Disney Renaissance formula. Okay, technically we had Epic too, which was basically Ferngully, but that's not exactly a plus so I'm not counting it. 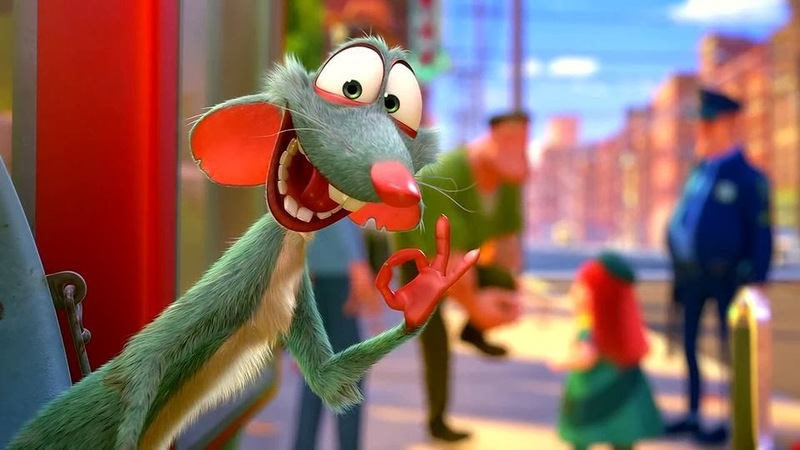 The point is, nostalgia was a factor in all of these, and it was the one thing that made me think going in that The Nut Job, the first wide release animated film of 2014, might turn out to be better than it looked. Unfortunately, that didn't work out as well as I'd hoped. 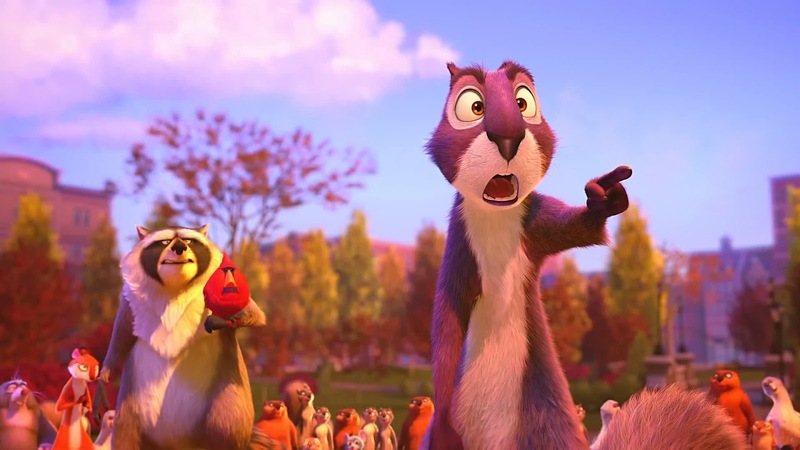 The Nut Job is pretty much Over The Hedge in an urban rather than suburban setting and with a much more explicit focus on the Heist film genre parody angle. It follows a surly squirrel named Surly Squirrel (yep, let that sink in) as he reluctantly teams up with a motley crew of park dwelling critters to rob a Nut shop, unaware that the business is a front for a group of mobsters planning their own heist of the bank across the street. 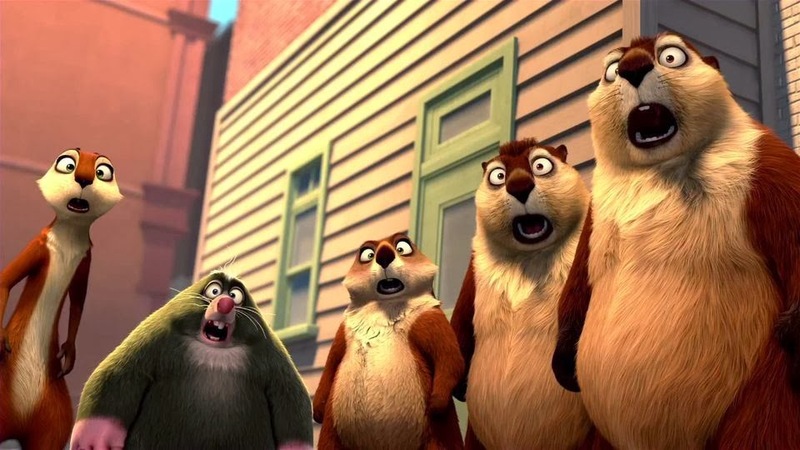 The thing about The Nut Job isn't just that its a bad movie, but that it actually tries to be a good one, or at least has the structure and approach of what could have been a good movie, indicating that the people behind it understand that structure, but weren't good enough to follow through with it. Its a heist movie with a vague Looney Tunes aesthetic and an interesting parallel between the interconnected worlds of humans and animals, which amounts to a lot of spinning plates, but no skill whatsoever at keeping them aloft. To understand why I had any hope for this movie, you have to understand the state of modern animated film since the onslaught of CGI. Today, we have two basic formulas, the Pixar model and the Dreamworks model, which is basically to Pixar what Sega Genesis was to Nintendo in the 90's, rough around the edges and generally inferior, but "cooler" in that fake, eyebrow arching sort of way. The common factor is that these movies can't just be cartoons anymore, but rather movies that just happen to be animated. Cartoon characters don't have to be heroes on Campbell's story circle, growing and changing and learning, they just have to explode, make funny faces, and run off cliffs. They are defined by their inability to change rather than their capacity to do so. This ethos is why Free Birds worked as well as it did, because as stupid as it was, it didn't try to be anything else. The Nut Job feels like it wants to take this approach and seems designed to facilitate it, but it can't escape the temptation to mire itself in pointless pathos and sentimentality that doesn't fit with its much sillier world. This wouldn't have been so bad if the heist element worked, but as much as the movie tries to evoke the style of a heist film, it almost deliberately neglects to do what needs to be done to make it work from a structural standpoint. The appeal of a this kind of story, and even a parody of one, is the intricacy of the caper and the elegance of watching it unfold as unforeseen complications threaten to unravel the best laid plans of impossibly smart thieves. That sounds obvious to anyone who has ever seen one, but you wouldn't think that anyone involved with The Nut Job ever had once you see how easily the main characters are able to get in and out of the proverbial vault, and the complete lack of any planning whatsoever. The complications here are not procedural, but rather personal and emotional as Surly has to learn to work together and be less, well, surly to deal with the practical issue of moving so much loot from a building in the city to a nearby park. As you might guess, most of the movie is spent on this dilemma, and almost none on the thing that could have been somewhat novel and entertaining. 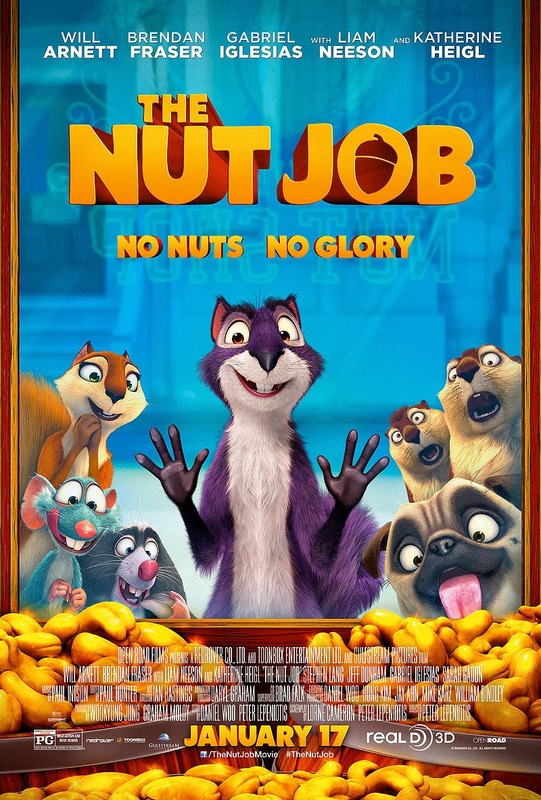 I want to give the movie more credit for at least trying, and in theory I tend to hold it against a movie more if its obvious that no effort was applied (see Ride Along), but the fact that this actually could have been a lot better if they'd only tried a little harder kind of makes The Nut Job more disappointing than it otherwise would have been. Something like last year's Escape From Planet Earth was bad, and only notable since it too was the first big animated movie of the year, but it was ultimately forgettable. This one hurt just a little bit more, and while I doubt it will end up anywhere near my bottom five for 2014 when all is said and done, its the kind of bad movie that feels just a little insulting in the way it wastes its time and potential. They cared just enough to set up a movie that could have been a breath of fresh air and a loving nod to a bygone era of old school cartooning, but for some reason they were too lazy to live up to it, and for anyone who loves animation as much as I do, that's somehow worse than if they'd just stuck with the mold.